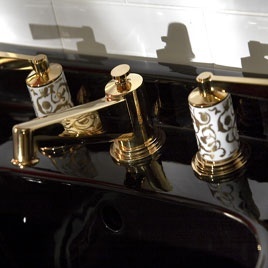 Drawing on the success of the New Black range of bathroom suites, Healey & Lord Ltd in partnership with Portuguese ceramics factory Valadares have developed the Neo Black, a bathroom suite inspired by the timeless elegance of the 1920’s and 30’s Art Deco movement. The Neo Black toilet is available with a choice of close coupled cistern, low level cistern or a stunning high level cistern tank. Basins are available in either 610mm or 670mm width sizes, with or without splash-back and in either 1 or a luxurious 3 tap hole combination.